The New York Times bestselling author of Flight Behavior, The Lacuna, and The Poisonwood Bible and recipient of numerous literary awards—including the National Humanities Medal, the Dayton Literary Peace Prize, and the Orange Prize—returns with a timely novel that interweaves past and present to explore the human capacity for resiliency and compassion in times of great upheaval.Willa Knox has always prided herself on being the embodiment of responsibility for her family. Which is why it’s so unnerving that she’s arrived at middle age with nothing to show for her hard work and dedication but a stack of unpaid bills and an inherited brick home in Vineland, New Jersey, that is literally falling apart. The magazine where she worked has folded, and the college where her husband had tenure has closed. The dilapidated house is also home to her ailing and cantankerous Greek father-in-law and her two grown children: her stubborn, free-spirited daughter, Tig, and her dutiful debt-ridden, ivy educated son, Zeke, who has arrived with his unplanned baby in the wake of a life-shattering development.In an act of desperation, Willa begins to investigate the history of her home, hoping that the local historical preservation society might take an interest and provide funding for its direly needed repairs. 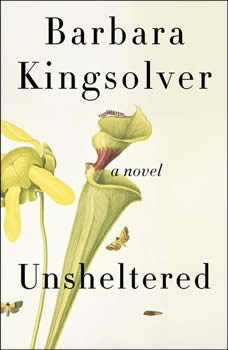 Through her research into Vineland’s past and its creation as a Utopian community, she discovers a kindred spirit from the 1880s, Thatcher Greenwood.A science teacher with a lifelong passion for honest investigation, Thatcher finds himself under siege in his community for telling the truth: his employer forbids him to speak of the exciting new theory recently published by Charles Darwin. Thatcher’s friendships with a brilliant woman scientist and a renegade newspaper editor draw him into a vendetta with the town’s most powerful men. At home, his new wife and status-conscious mother-in-law bristle at the risk of scandal, and dismiss his financial worries and the news that their elegant house is structurally unsound.Brilliantly executed and compulsively listenable, Unsheltered is the story of two families, in two centuries, who live at the corner of Sixth and Plum, as they navigate the challenges of surviving a world in the throes of major cultural shifts. In this mesmerizing story told in alternating chapters, Willa and Thatcher come to realize that though the future is uncertain, even unnerving, shelter can be found in the bonds of kindred—whether family or friends—and in the strength of the human spirit.